David Burk is the 2012 recipient of the Kansas CCIM chapter and WSU Center for Real Estate Lifetime Achievement Award in recognition of his vision and dedication to the renewal of downtown Wichita. Mr. Burk is a licensed architect, planner and developer specializing in historic renovations and public private partnerships. 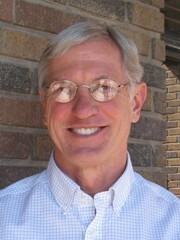 Originally from Iowa, Dave came to Wichita in 1971 and began his career as an architect. After working with several firms over the years, he began his own firm, Watson, Breidenthal and Burk. In 1989 the firm was dissolved and Mr. Burk, through MarketPlace Properties, L.L.C. went into development full time. MarketPlace Properties began negotiations with the City of Wichita in 1987 and in early 1988 was named the preferred developer in the Old Town Marketplace District. MarketPlace Properties started construction of the first project, the conversion of the old Modern Cleaners Building into Larkspur in 1991. Since that time, Mr. Burk has been involved, both as an architect and developer, in the redevelopment of 39 buildings as well as the expansion of Old Town to the north into Old Town Square. Old Town has won the 2006 Smart Growth Achievement Award from US EPA and the 2008 Great Places in America Neighborhoods form APA. Mr. Burk was a partner in the WaterWalk project in downtown Wichita – a private/public partnership in the mixed-use redevelopment of 25 acres just south of the Hyatt Hotel. Currently, he is involved in Block 1, a private/public partnership that involves the complete renovation of a city block in the heart of our downtown. This involves a hotel, retail, offices, entertainment, an urban park and a parking garage faced with retail. In 1999 MarketPlace Properties received the “Over the Years Award” from the Wichita Chamber of Commerce. Mr. Burk is also active in the Downtown Rotary Club, WDDC and Wagonmasters. In 1992 he was selected as “Downtown Business Person of the Year” by the Updowntowners. He has served on the State Sites Review Board, the Way Finding Committee, chaired the Historic Board, served on the Tourism Council and Wichita’s Leadership Council. Mr. Burk and his wife DJ have been married 34 years and have two grown daughters. They live in the place they love, a converted warehouse condo in Old Town. They share a vision and commitment to enhancing Old Town and downtown Wichita through their continued development work, their support of cultural events and the arts. Mr. Burk is the eighth recipient of this award, joining Colby Sandlian, the late Jack Hunt, George Ablah, Jack DeBoer, Michael & Nestor Weigand, Stephen L. Clark, and Herbert L. Krumsick.